This recently raised pyramid roof is one of the biggest hipped roofs we've built, with an 8m span and 6m hips seated down on dragon ties. Despite a few challenges along the way, the whole project went really well, and its now sitting 'ansomely on an east facing cliff top overlooking Gerrans Bay. Raising day was long and gloomy, and the frame was quickly shrouded in scaffolding, felt and battens, so photos of it in place will have to wait 'til a later date. 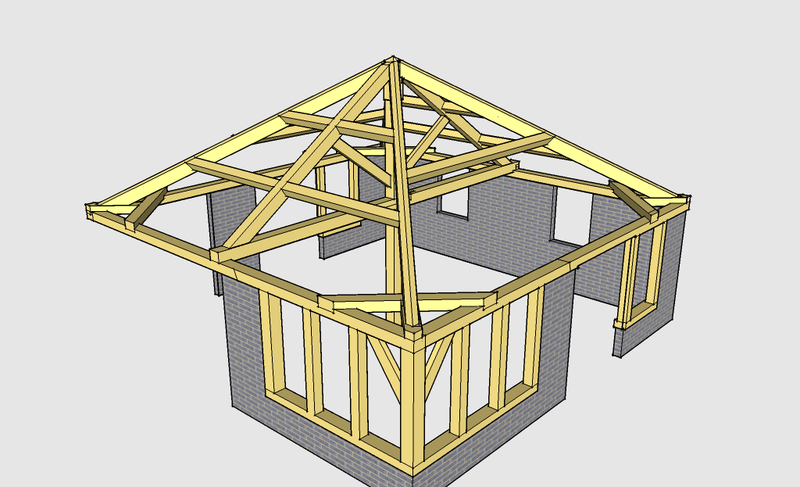 From an early stage we designed in a large kingpost truss to support the long purlins that would be framed around the roof lights. This truss was built off an 8m x 200mm x 200mm tie beam that, in a change to our normal 'West of England' timber sourcing policy, came from Normandy. When we planed and orientated this beam in the workshop, we found a large ominous looking fault...a significant knot, surrounded by very short, swirling grain and worrying lateral cracks. 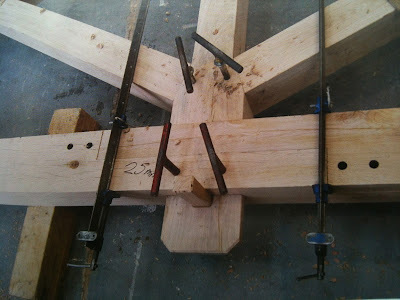 After much cursing, consulting and head-scratching, I remembered an article by Lui Rocca in the Mortice and Tenon, the quarterly journal of the Carpenter's Fellowship, of which I'm a member. 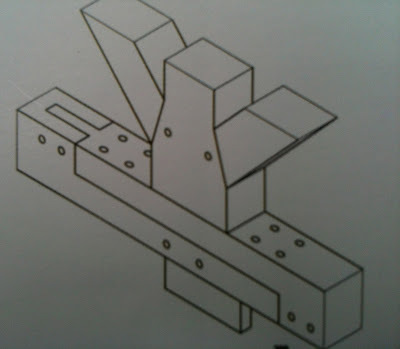 The article described a similar dilemma, where a long tie beam was needed but not available with the time frame. 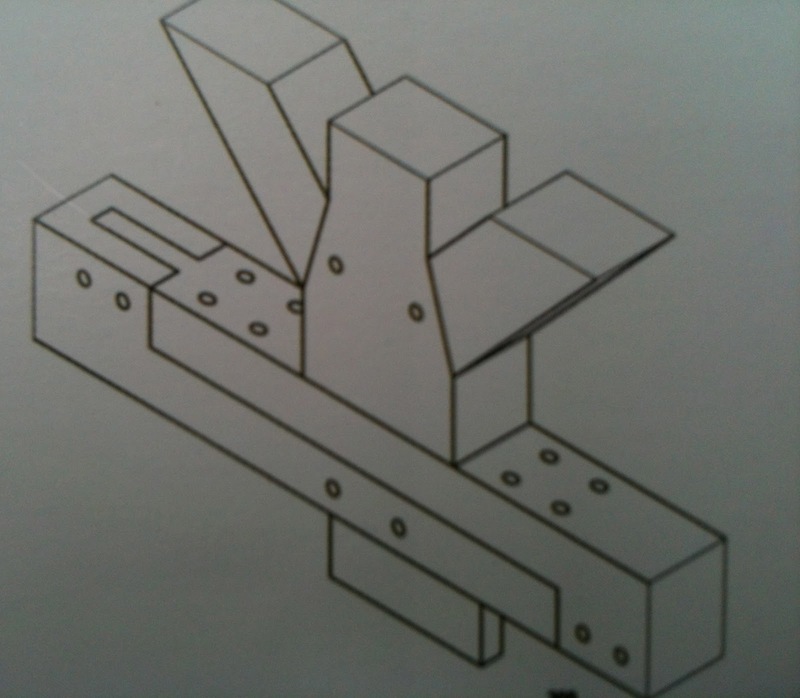 After very careful assesment of the forces involved, and the approval of structural engineers, a tabled scarf joint was used under the kingpost to join 2 shorter lengths. So, reassured by Lui's experiences, I got out the chainsaw, took a deep breath and cut my long, expensive tie beam in half. The half with the knotty fault was replaced with another clean piece from the stock pile, and the two shorter pieces scarfed together. 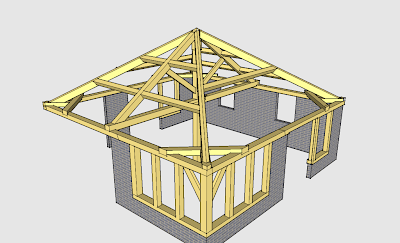 The outcome proved excellent, even fortuitous; easier transportation to site, easier raising and craning, and a nice joinery feature in the heart of this fine roof. It'll be featured here in photo form as soon as I can, but in the meantime I hope Lui won't mind me using two of his images below to illustrate what we did...full credits and thanks to him.